My newest work will appeal to the juvenile age group (7-10 years of age). Catfish was the only catfish who was taken to the secret part of the ocean, where she enjoyed a easy fun life. But now, she needed her Momma Cat. Because, Momma Cat is the only fish able to teach her the ’catfish dance’ and without it she can’t hope to find a husband. Catfish knows she must learn the dance soon before her skin looses its shine and her whiskers grow droopy. In order to allow Momma Cat into these secret waters Catfish requires the Sturgeon General signature on the permissions papers. But, the only fish who knows how to locate the Sturgeon General happens to be the pesky little tadpole. Finally, Catfish is resigned to having to endure his annoying ways and refusal to speak with her. She knows Tadpole thinks she’ll eat him. But why would she? A little fish would be quite tasty but, a little tadpole who is almost a green froggy thing, most certainly is not! So, Catfish sets out to persuade Tadpole he is safe in her company. After much coaxing, reluctantly, he shares with her the information she requires and soon, Catfish sets off on an adventure. Or, it seems like an adventure until she nears the entrance to the Sturgeon General’s cave and the Bass guards decide she looks deliciously like, ‘good eating’. Catfish only just escapes with her whiskers. It is the beautiful angelfish who comes to her rescue. Angelfish just happens to be the Sturgeons Generals secretary. And after Catfish praises the beautiful fish several times, Angelfish agrees to help her get an audience with the Sturgeon General. However, the path to his door is fraught with danger. 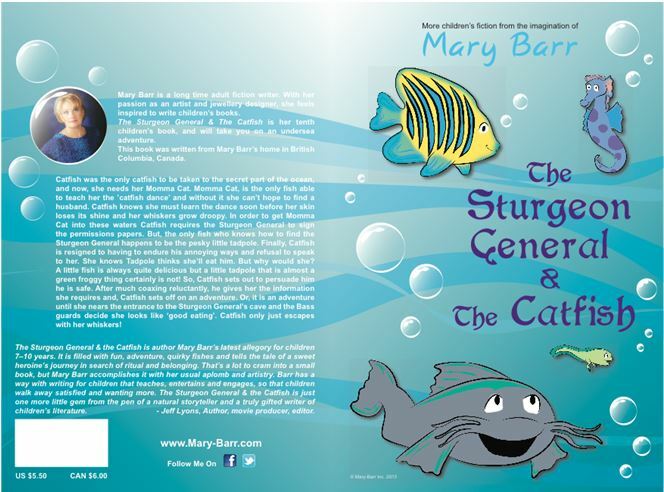 When finally she meets the Sturgeon General she is dismayed to see he is a large, daunting fish who is not interesting in talking to a little Catfish at all. He only remains not interested however, until he discovers Catfish wants to learn the catfish dance from Momma Cat. Suddenly, she has his full attention and in no time at all Momma Cat arrives and the dance is mastered.